It's a whole spectrum of choices when it comes to cars. One extreme prefers motorcades while the other prefers to walk and there are millions that fall in between. I didn't want to spend a lot of money on a motorcade that would add absolutely nothing to my wedding, except of course, lovely motorcade pictures. So I went beautiful and cheap. Instead of renting a bridal car from a wedding car agency, I went for a high class car rental favoured by rich business people. These companies usually have high end cars for rent and prices depend on the make selected. I was able to specify the color and went for a black Mercedes. That was enough for my bridal party and I. What I paid was the equivalent of a trip to the airport. If you need to arrange transport for the photographer and videographer, have someone hail or call for a cab. Friends' cars were put to great use too. Our parents, my husband and some friends drove to church in friends' cars. My church is located in the old Town, Prague. This is where you get all the tourists and tour services, like Vintage car tours. 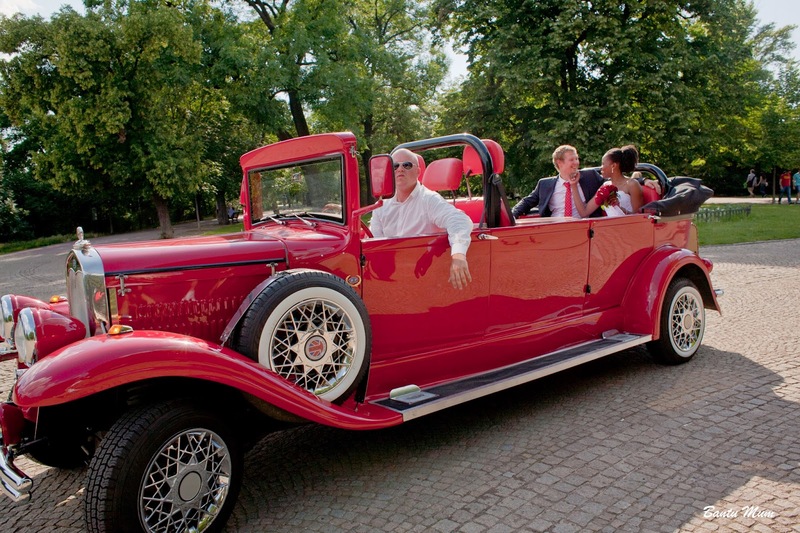 We simply walked up to the driver of a red vintage car and gave him directions to the reception and that was all. We paid the equivalent of a short Prague tour - no waiting charges. The videographer had a car and travelled with the photographer to church and to the reception. Car decoration was a DIY project. I made the ribbons and friends pinned them onto the cars. If the car is classy, it doesn't really need a lot of decoration - BUT - again, that's just me. A few decoration ideas in Florist. I totally forgot to arrange ceremony to reception transportation for the parents. They walked to the reception area and I felt terrible about that. Thankfully, it was within 30mins walking distance.